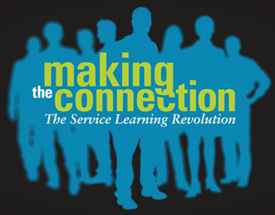 Making the Connection presents a complete perspective of Service Learning as an education strategy, featuring interviews with over 30 practitioners, including educators, trainers, and students in a variety of experiential learning environments. The film is arranged by community “impacts:” community and personal growth impact, career choice impact, civic engagement impact, social issues impact, career preparedness impact, and financial impact, allowing for an instructor to access a particular “impact chapter” without scrolling through the film. Making the Connection is also available in two running times, at 45 minutes and 15 minutes, depending on the needs of the educator or administrator. The film was made for educators by educators as an introduction to Service Learning and its possible educational outcomes. Collectively, husband-and-wife team Christina Hicks-Goldston and Jason Goldston have more than 30 years teaching in higher education, which includes Service Learning. Together, they have created a resource hub for educators to access as they integrate Service Learning in their teaching. While the American educational system has been transforming in the last years of the twentieth century and early twenty-first century, the transformation has not matched the pace of many of the technological and social changes in our world. Service Learning provides a core foundation for a stronger educational philosophy – literally "learning while doing” and applying that knowledge. America’s public education system originated in the 19th century, in a largely rural, agricultural economy. The 21st century is vastly different from the 19th century; while the original learning environment was created to meet the needs of the community, the current learning environment is no longer representing that ideal. The Internet has democratized information in a drastic way. The transactional model of the learned instructor transferring information to pupils in a single room with a primary reader is now obsolete. Although students have access to any question about any subject through their mobile device, knowledge is about making the connection between different pieces of information. The key to effective instruction and learning is engaging students as individuals and empowering them to choose subjects they are really interested in, and allowing them to make the connection between their favorite subject and their least-favorite subject by connecting learning to a bigger picture. We have slowly started to listen to neuroscientists and teach the way the brain learns. Our knowledge of the inner workings of learning has expanded exponentially these last few decades, and our educational system should reflect this knowledge. Service Learning is a varied and unrestrictive process that can be implemented in a wide array of course designs. It encompasses grades K-12 to higher learning, and can be used in a variety of environments. Making the Connection provides an engaging and informative message that educates and encourages the growth of Service Learning across America and beyond.